Having recently returned from the Canyonlands in the American Southwest as I write this short review, I find the 14-day tour of the canyons to be a great way to see a snapshot of each different geological segment on America’s well-known National Parks “Grand Circle” that tracks through Utah and Arizona. In case you want to follow the Grand Circle, here’s a sample itinerary of what I did out there. Without further ado, roughly the details of the roundtrip experience you can easily do with a car in 10-14 days. Fly in to Las Vegas (or drive), and head to Williams to get closer to the Grand Canyon. I stayed in a log cabin AirBnb which was so rustic and pleasant, it could not have gotten any better. Located roughly 45 minutes from the South Rim of the Grand Canyon, the drive through the Kaibab Forest and the changing landscape scenery only made the sheer astounding, stunning beauty of the vast Grand Canyon more immersive due to the contrast. This is where I went, although I am sure the North Rim is equally gorgeous in a different manner. The South Rim was stunning and in October, it was pleasant with a couple warm layers and a strong wind breaker or coat. The wind could get very gusty in pockets of rock or exposed surfaces and make the air feel like it was nipping coldly even though wearing warm clothes. Sand also gets blown about, so be aware of that on your hikes. 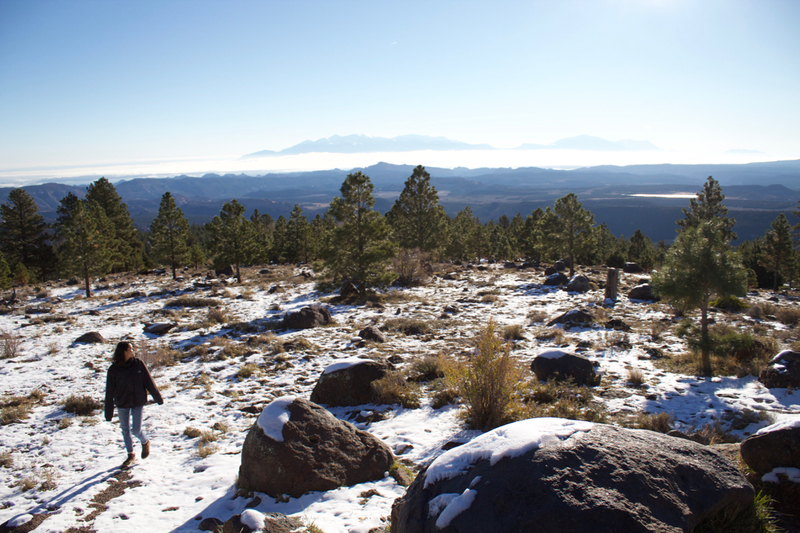 The Kaibab Trail down to Skeleton Point has multiple scenic photographic spots to stop and rest. It is a steep trail in places, not very difficult if you are in decent shape, but it takes time and energy, so be prepared. It is a 6 mile round-trip trail up and down the canyon, to Skeleton Point and back to the top. You’ll have to take a quick bus ride to reach the trail head from the Visitor’s Center and the Parking Lot. I have also heard the Bright Angel Trail is particularly pretty, but I did not go on that one this time. Visit the NPS for more information on the Grand Canyon and the best trails. The drive takes roughly 3 and a half hours from Williams to Page, so give yourself time to rest. For me, this day was spent getting over jet-lag and adjusting to the magnificent scenery everywhere around me. The sheer enormity causes a different view of perspective – everything that seemed so vast and important before started to diminish in the scale of long stretches of vastness visible everywhere, in the mountains and outcroppings of the desert. There is a Safeway in Page, which is part of the Kroger chain, so you can stock up on groceries here if you need. It is fairly large and has everything you might need, organics, vegan, meat, toiletries, and so on. Although everywhere is beautiful in the Southwest, with its geological formations that have lasted through time, Page has the Antelope Canyon Tours in the Navajo Nation. The name of the tribe is actually the Diné – the Spanish gave the name “Navajo” to the Diné tribe of Native Americans that existed before when the Spanish came over to America, so please be aware and be respectful of the Diné. They have peaceful ways, and sacred lands. 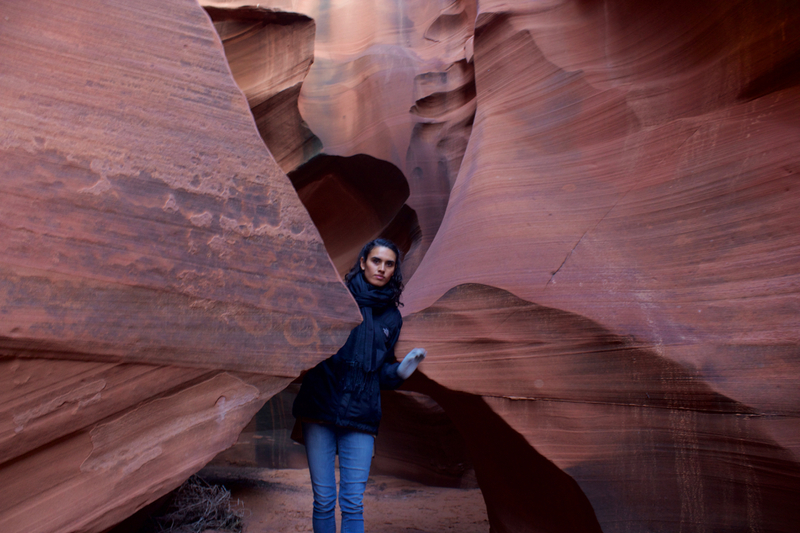 The Antelope “slot” canyons are stunning. They are sacred, both upper and lower, and I recommend visiting both if you go. Carved with wind, water, sand, and time, they are like waves and ribbons of orange and red waving through the desert itself. If you decide to venture through them, please don’t deface the canyon or climb on the walls or trash the place. It’s truly amazing and something special. They have been there for millions of years – it’s not right for tourists to mar the place in a span of minutes in one day. They do tend to get crowded, so be prepared to take photos with lots of people around you when you’re there at high ISOs in the canyons. No bags or skirts are allowed as the canyons climb through narrow places. I went with a Diné-owned Antelope Canyon Tour company: Adventurous Antelope Canyon Photo Tours, as it is their lands and their canyons. Fun Fact: While driving to Page, AZ, you’ll also get to see Horseshoe Bend, a sheer drop-off cliff with the Colorado River winding its way through it, located in a desert spot just off the highway. Take photos, take selfies, take in the view – and don’t fall into the Colorado River. It’s really steep and far below, which is what makes Horseshoe Bend so stunning. I saw lots of people getting precariously close to the edge the cliff’s sheer drop-offs with their outstretched selfie sticks, trying to take better selfies. It looked extremely dangerous and awfully risky. There are signs however warning against the dangers of getting too close to the edge and stepping out on unsupported rock. Drive to Needles, part of the Canyonlands National Park near Monticello, Utah. To get to Needles Outpost, which is a fine camping site with plenty of hot water in the showers (so I am told). I did not actually go in to the showers. I was too tired and cold and had already showered that morning in Page to attempt it. To reach this remote paradise of absolutely nothing but natural rock beauty, you’ll have to drive several hours. The drive takes you down Highway 98 from Page to Highway 160 to Kayenta, through Monument Valley (in itself a national treasure). Remember, you’re in the desert and in the Indian Nation, so there are very few gas stations and small towns around for over an hour or so on these long drives through the desert. It’s truly beautiful to be out there in the middle of the wilderness. Slickrock is by far the most scenic short trail. It’s a 2.4 mile roundtrip loop through the canyons, with their roughly shaped, irregular beauty that is simply charming and awe-inspiring at the same time. Needles has some of the most interesting rock formations and pristine beauty because it is so remote and inaccessible compared to the bigger attractions like Bryce Canyon and the Grand Canyon. 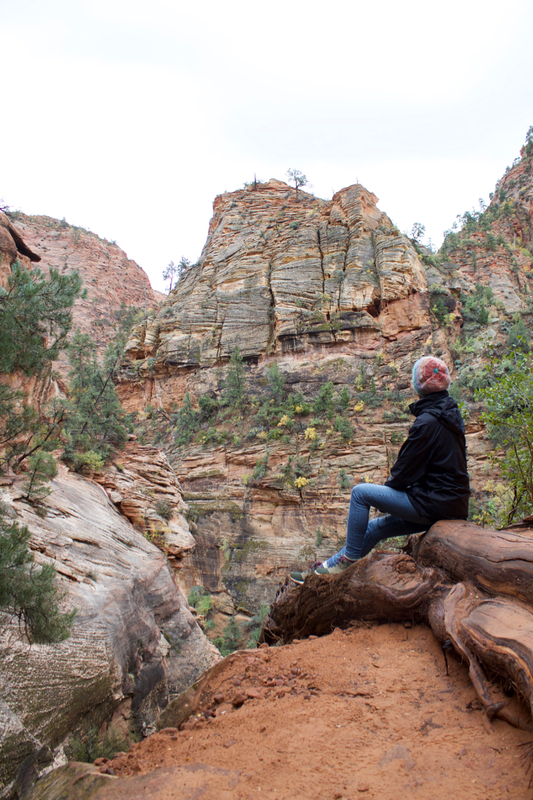 That’s why I recommend true wilderness people – the people who want to be peacefully alone in nature – to go there. It’s what you will find. I also did the shorter hikes on the NPS guidelines (Roadside Ruin, Pothole Point – we could not find the cairns to mark the trail and turned around after twenty minutes or less, and Cave Springs, which had good views), but those are more tourist attractions. Slickrock is the best one if you are only there for a short time and don’t want to exert yourself too much. You might see rock climbers on the high cliffs if you spot them, but they are hard to see as the crags are high up from the road. Driving to Moab is the halfway mark of The Grand Circle, at least it was for me. 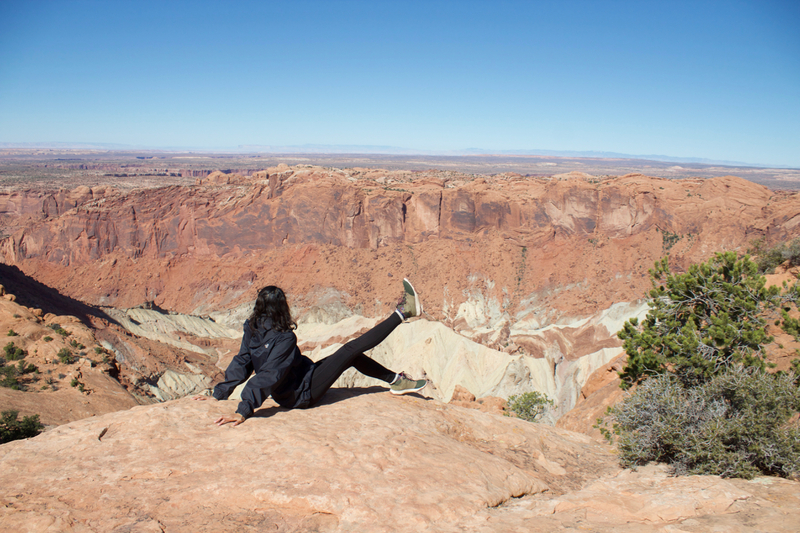 I spent three nights in Moab and it was plenty of time to rest and see Arches National Park and Island in the Sky, although if you’re happy in the outdoors, you could spend months and not want to leave. We were lucky enough to stay in a fun little Airbnb with 1960s interior decor and a large hot-tub in the back, which made the cold stays in the cabin and camping sites of the previous days evaporate away under the desert skies and cold evening air. The best time to go is before sunrise. Early morning is when few people will be heading to the park, right before dawn. That way you can hike the 1.5 mile steep climb up the rocks to see Delicate Arch, take photos, and come back before the crowds. Then go to Devils Garden and see how far you can take the 7.2 mile roundtrip “primitive” trail to see the arches! Warning – don’t go beyond Double O Arch if you have vertigo or fear of heights. The trail goes for roughly 100 feet over a long stretch of rock “fin” with steep drop-offs on either side and occasionally, strong winds. With the clothing we had on, we could not do it. The wind would fill the air-pockets in our clothes and lift us up like a parachute. Until the Double O Arch, you can see the magnificent Landscape Arch, truly natural beauty. Not far along is the Partition Arch and the Navajo Arch, with a little body of water inside and a pine tree. It is all beautiful in Arches National Park. The loop to Double O Arch and back is 4.2 miles round-trip. Wear hiking shoes and bring water and food to eat later when you are done. There is still plenty to see afterwards, on the drive out of the park, from Fireside Furnace, Balanced Rock, the Windows, and the La Sal Mountains. By far one of the most remotely beautiful places in the region, Island in the Sky has a special beauty because it is located a mile high. The road winds up to the top of a plateau where grass and trees grow and eagles land in the rocks away from people. With not many large parking lots, Island in the Sky is not made for crowds. It is for those who seek serenity and peaceful moments, who can appreciate the exertion it takes to see a stunning view off a trail, because although the drive in is beautiful, it was off the trails about a mile or two in that I truly admired the surrounding landscape away from cars and traces of people’s work. The best places to go in a short day are Mesa Arch, White Rim Overlook (we didn’t go on this trail this trip, as the Grand View Point goes roughly the same direction), Grand View Point, Murphy Point, and Upheaval Dome. Leaving Moab, the 191 turns into a desert and you’ll have to take the 70 west back to Las Vegas, in that direction, at least. Scenic Byway 24 is one of America’s most beautifully scenic drives, and I recommend taking it if you’re going that direction. On it, you’ll see Goblin Valley State Park, one of Utah’s hidden treasures, and see stunning views all the time. Captiol Reef National Park is beautiful, during the day or at sunrise or sunset. There are not many restaurants or places to get food, so be aware, it’s only a small town in Torrey. That’s what makes staying there fun. It’s the camping experience of being in the old southwest that is evoked here. I recommend the La Cueva Mexican Restaurant for its friendly service, big portions, and hot, good food. The two best short hikes are Hickman’s Bridge, a 2 mile round-trip loop to a natural rock bridge and stunning canyon views, and Cassidy Arch, a steep 3.2 mile round-trip climb around the edge of the mountains to see Butch Cassidy’s hideout. Bryce Canyon and Kodachrome Basin, Grand Staircase, etc. Leaving Capitol Reef taking the Scenic Byway 24/Highway 24, you’ll drive through an alpine forest with views of mountains and snow. It’s absolutely beautiful. Larb Hollow is a great place to stop and take photos and see how far you have come along the Grand Circle, and to go onwards through the Grand Staircase in Escalante and drive towards Bryce Canyon. Along the way, you’ll pass Anasazi Village (I did not stop here), Petrified Forest (I did not stop here either), and the Kodachrome Basin State Park, which has spectacular views of delicate sand formed geological rock formations that geologists call the Entrada. Bryce Canyon is absolutely breathtakingly beautiful. To take photos of its beauty is almost damaging the parks beauty because it does not capture the crystal castle-like, pure beauty of the natural state of the park. Please don’t mar the park’s beauty by tampering with it while you are here. Like the Antelope Canyons, there is something special about Bryce Canyon. Go down the Navajo Loop trail (1.3) and along the whispering pines and head out to the Queen’s Garden (1.8) for spectacular views, a 4.4 mile roundtrip hike. The prettiest time to see the canyon is when the sun is shining over the rock crystals, making them glitter in the light. 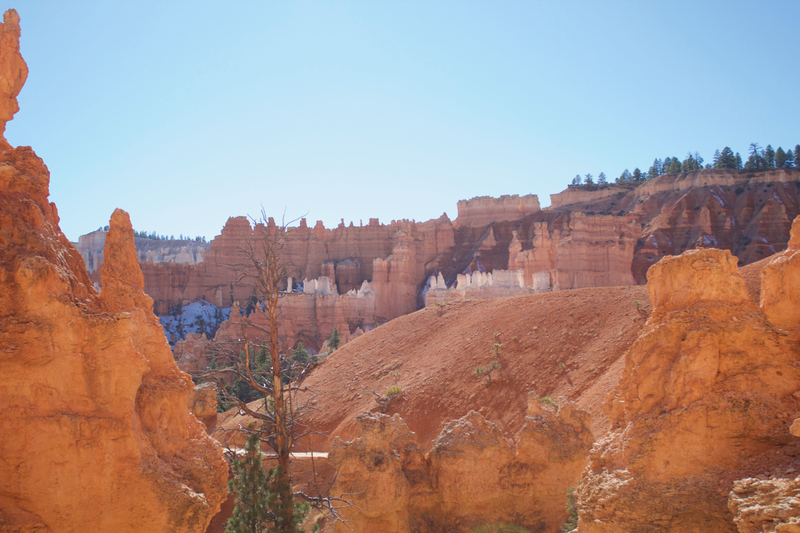 This trip planned for a day and a morning in Bryce Canyon, which was more than enough to see its astounding beauty. Zion was crowded and better for tourists than the other canyons, something which was different after the time spent in more remote regions. You’ll have to take the bus up to the 9 drop-off spots and hop-on and hop-off. With crowds, getting on the bus can take 30-45 minutes because of the long line, although the buses run regularly during the day, from about 7:30-6:30, but check the NPS site to be sure. The best short hikes are Riverside Walk to see the Narrows, Weeping Rock, and Lower Emerald Pool Trails. We arrived there in the morning, and spent the evening seeing those three, the Narrows riverwalk being the most famous, and Weeping Rock in my opinion the most naturally beautiful with the falling drops of water and the hanging gardens surrounding the large cave at the end of the trail. There’s also an astounding view at the end of a steep, rocky, drop-off type trail, the Canyon Overlook, 1 mile roundtrip, that provides a vista of the crags and peaks from above, in the mountains, capping off the trip. It was raining the next morning, but this one last journey was beautiful in the mists. Two nights were spent in Las Vegas, although the trip itinerary we originally had planned for two nights camping in Zion, although the end-of-season cold October thundershowers and cold camping weather made us decide to head to Las Vegas. Even with eating healthy foods and drinking pure spring water the entire trip, I was starting to get sick. Although stronger physiques could most certainly withstand this moderately grueling schedule, my already weakened physique from the strain of other long travels made it harder to continually adjust to the evolving warm or freezing cold temperatures, long day hikes and being hours on the road, and staying places with varyingly bitter temperatures or heated rooms. We stayed in the Park MGM on the Las Vegas Strip, which is an experience of lights and noise. It’s the city, which is vastly different from the serenity of natural beauty, a chaotic natural force in itself. Las Vegas has no time, and is best at night. Walk the strip and you will see all you need to see. Thanks for reading, and I wish you fun planning your next adventure to the American Southwest with its magnificent Canyons and the Diné canyons! As always, all opinions are my own. As usual, time for the photos, although this time I’m sharing less then usual as there’s a request for a travel book from the photographs I took in the southwest. Enjoy!